Ruthless great art - Roland MacDonald interview. After that game was completed I was able to get out of computer games and go freelance. One of my first jobs was a board game for Cwali, Champions 2020. I did all the art and graphic design for that and another game. It was a bad experience though so it wasn’t until I started getting more interested in board games personally that I decided that I wanted to pursue more board game art again. 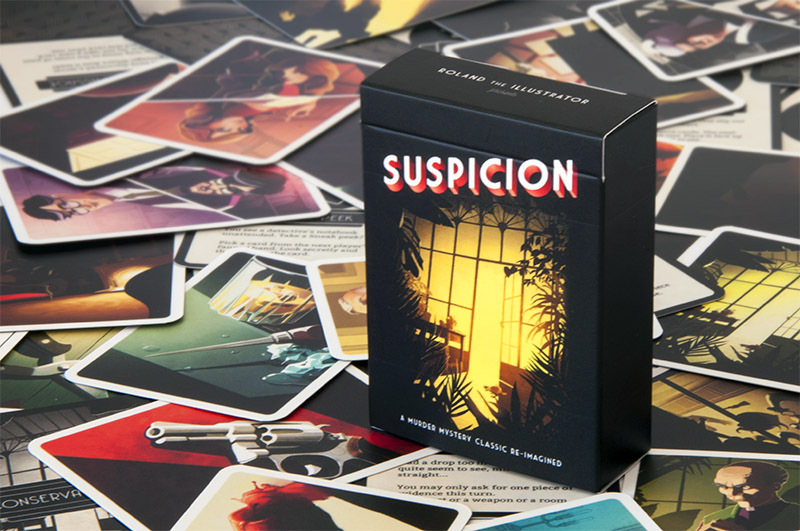 I made my first game Suspicion, a Cluedo mod, to give away to publishers at Essen 2015. Since then I have been focused mostly on Games art digital and tabletop. 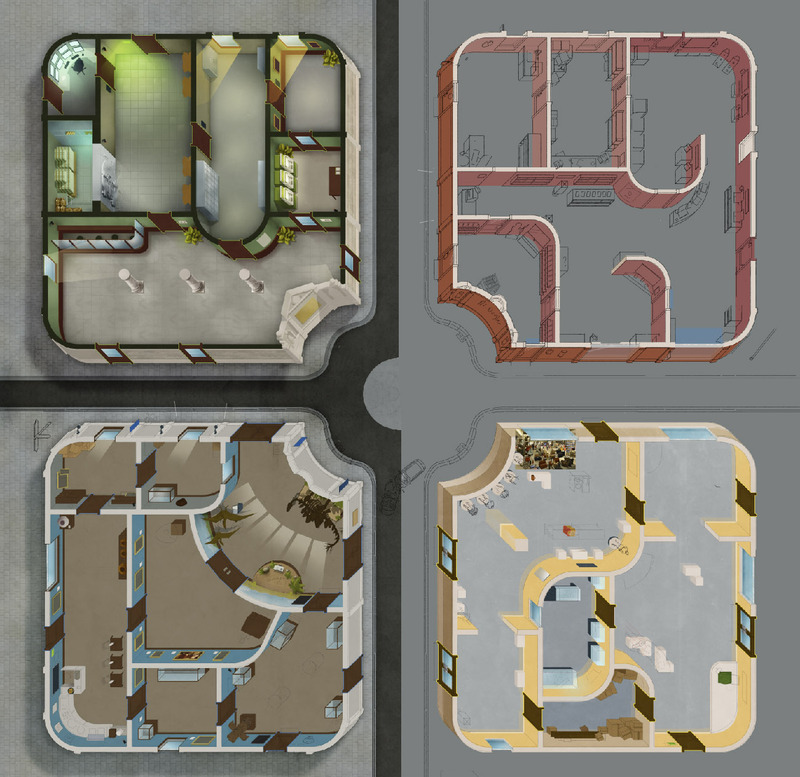 In the last year I have worked on Escape Room – The Game and and expansion, Stop Thief! from the interesting new company Restoration Games and Kaiju Crush for Fireside Games. I have also illustrated and published my own version of Reiner Knizia’s Battle Line and designed and illustrated my own game Ruthless that should published by Essen this year. You said “Ruthless” is you own – can you tell us about that game? 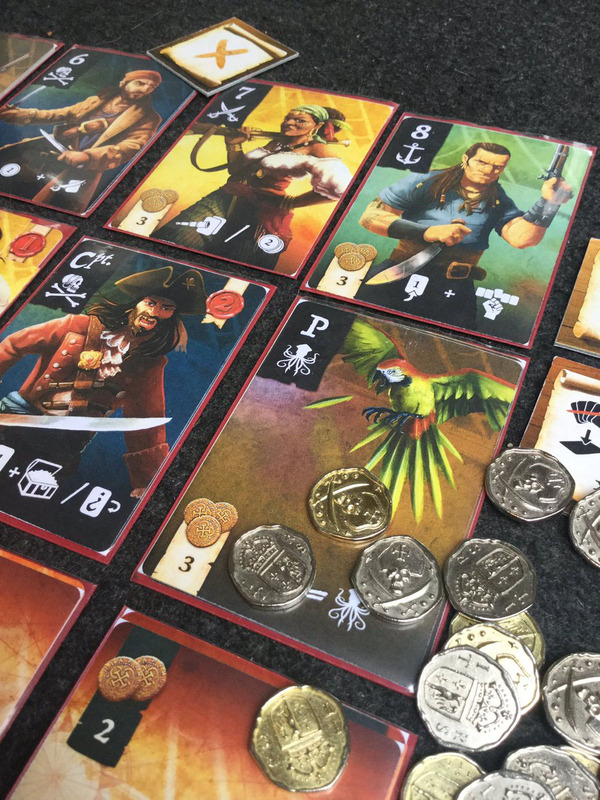 Ruthless is a pirate themed deck builder where players compete for notoriety by recruiting crews to hunt down the best ships on the high seas. It was originally conceived as a more thematic and strategic twist on the Ascension/Star Realms system but has found it’s own unique space. It does a quite a few things differently to most deckbuilders that I think make it exciting and thematic. Firstly when you acquire new cards/recruit pirates they don’t go to you discard but come into play immediately and their actions activate. This can create a cascade of actions. These pirates remain in play until the end of the round when they are arranged with the other pirates you have in play to form Crews (poker style sets). The player with the strongest crew captures the best ‘Ships’. There are multiple ways to win and variability offered by end game achievements. It plays well with 2-4 players. There are plenty of other things going on but this gives you an idea about the game I hope. I started developing the game in March 2016 and got a good illustrated prototype ready for Essen Spiel ‘16. I showed it to a lot of publishers and nine of them took prototypes. I spent Jan – May this year refining the game with the publisher I chose and am eager to present it as a published game at Essen this year. I like the process of designing. It is a bit like playing a game or solving a puzzle. Which is something I also like about doing illustrations for games. Do you perceive yourself as a graphic designer or more as an illustrator? I am definitely an illustrator first but I have learnt a lot over the years and have some decent graphic design chops. I am particularly interested in UI/UX and the functionality of Graphic design and illustration with the gameplay. 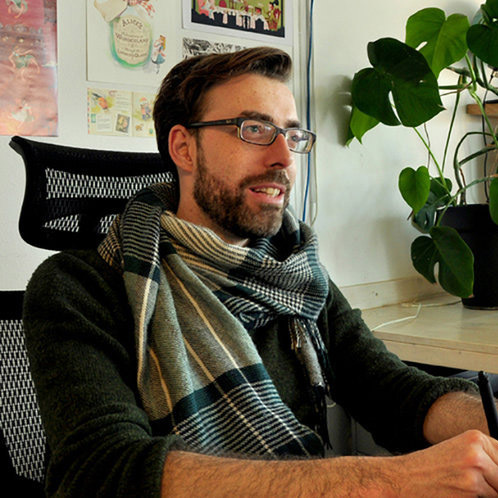 How and when (in the design development) do you prefer to be briefed on a new assignment? I really wish publishers would get in touch earlier than they do. Too often jobs are rushed and it is hard to make really great work then. A good illustrator, especially with a working knowledge of games, can bring more to a project than just some pretty pictures. Having the time to do research and explore ideas makes for better solutions in the end. I really wish publishers would get in touch earlier than they do. Can you tell us about the steps in your creative process when making a piece of art? For games I find it got to have an idea of how the game plays and how the art will be used and needs to function. Then I like to do a lot of research. Pinterest is excellent and I also have a lot of art books. From the research I do a lot of sketches. Often these are digital but if the weather is good I will take a sketchbook and work outside with a beer. The best of these sketches are shown to the client then refined. I like to work out a lot of details when painting the final images, it keeps the images fresh and make the final stage more fun. So my sketches are not very tight. 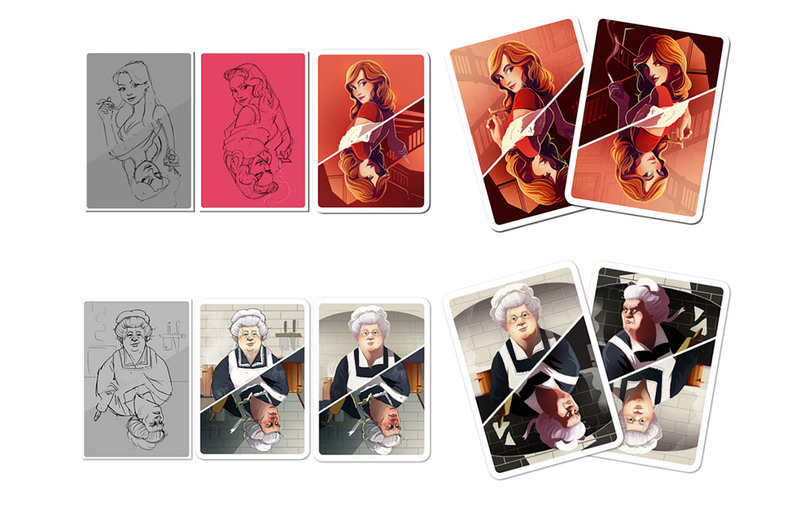 Next I do quick colour studies and then once everyone is happy I work up the final illustrations. Almost everything from sketch to final is done in Photoshop. It seems like you use 3d renderings in some of your work – is that correct or are you just rendering it so perfect in hand? (like the buildings in Kaiju Crush). When is 3d good and how do you use it? Funnily enough I planned to use 3D for Kaiju Crush but in the end it was quicker to do it by hand. I like to avoid my work looking too digital so I prefer to do it by hand. Sometimes 3D is a good choice though. 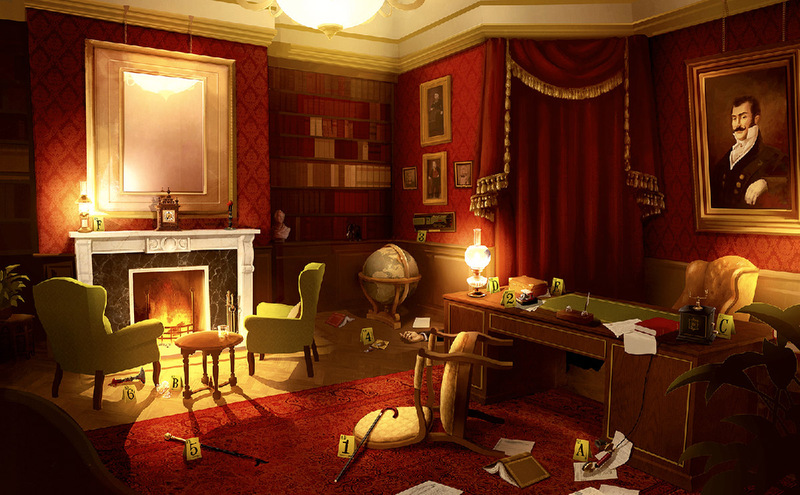 I did use it for one of the most complex illustration for Escape Room – The Game. 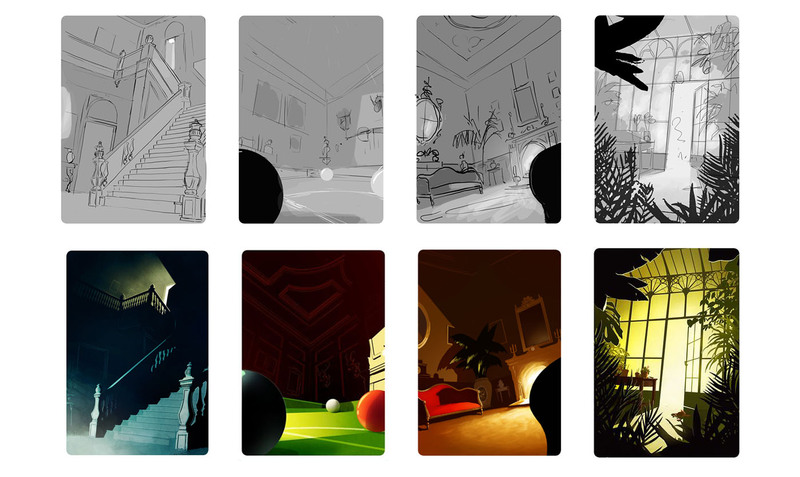 I did some quick sketches to get the layout of the room and a rough composition. 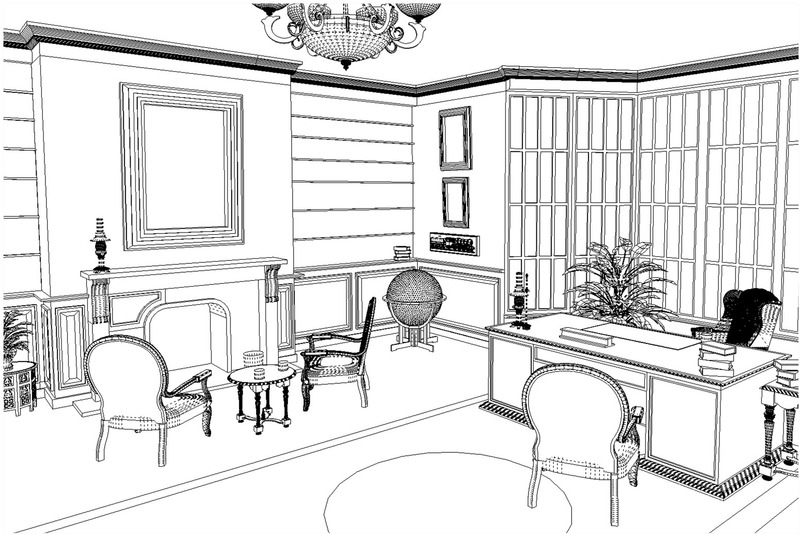 Then I modelled out a very rough room in SketchUp to use as a guide for perspective and to get a really nice composition. That project was on a very tight deadline and it was a complex environment so it just made sense. For me it would never be worth doing full renders though I find it faster and more satisfying to use a blocky model just as a guide. What in you opinion makes strong or good game art? It really depends on the game. 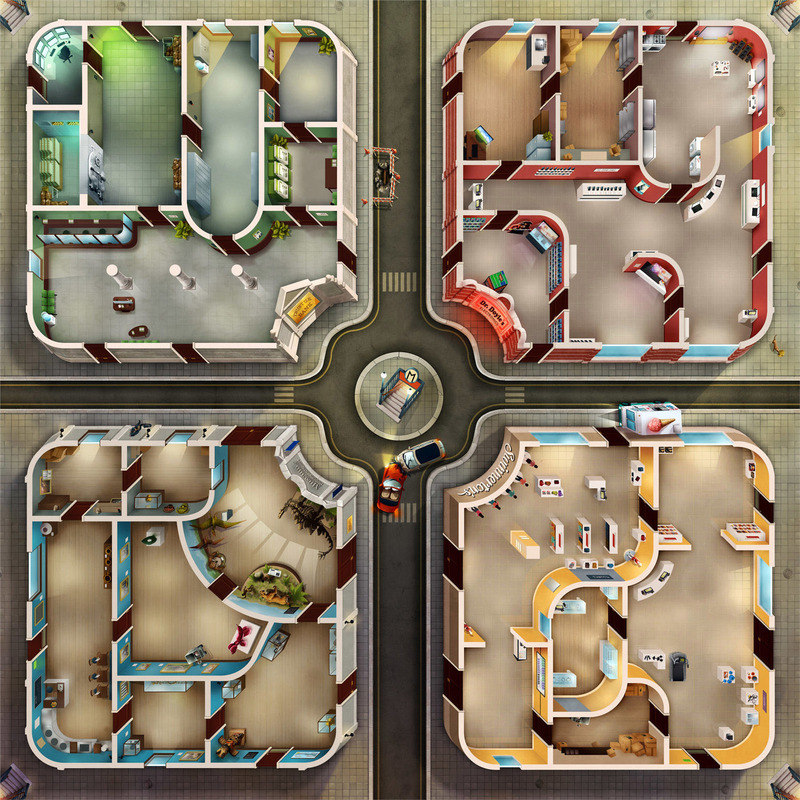 An abstract game and thematic game have very different requirements from the art they employ. Part of good art is that it draws us into the game world and the other part is that it enhances our experience of the game aesthetically but also functionally. Good art should also have a personality that suits the game. Good art should also have a personality that suits the game. Personally I won’t play a game that lacks visual appeal. There are so many good and appealing games out there these days I just don’t need to spend two hours looking at something ugly. Appeal pulls me to a game the game make me stay. I have also painted my Minis for Blood Rage and Scythe and that really adds to those game experiences. The player and the experience you want to evoke for them. 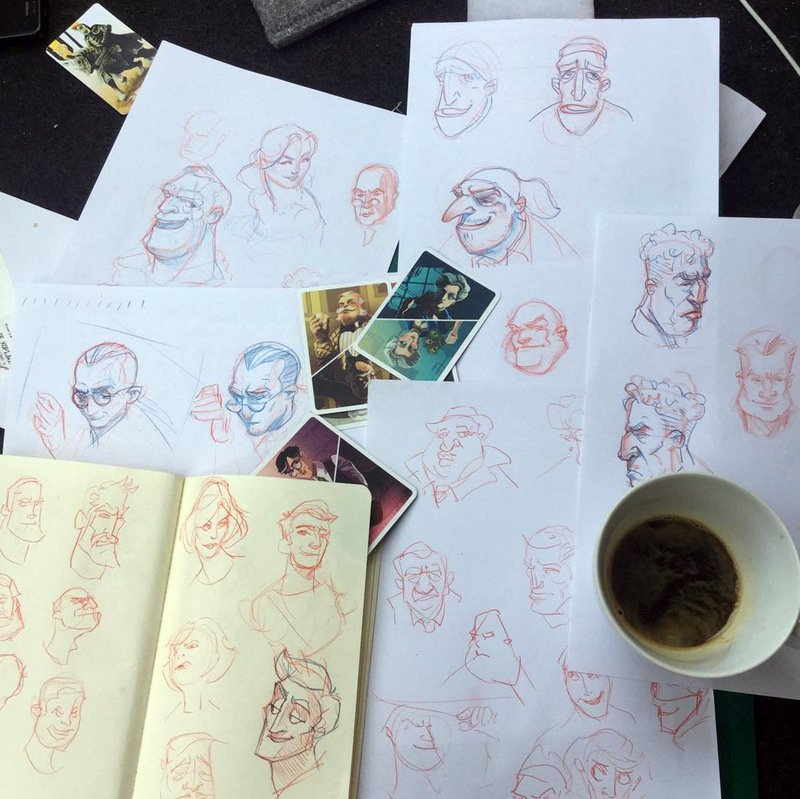 What was your biggest challenge on making art for Stop Thief? 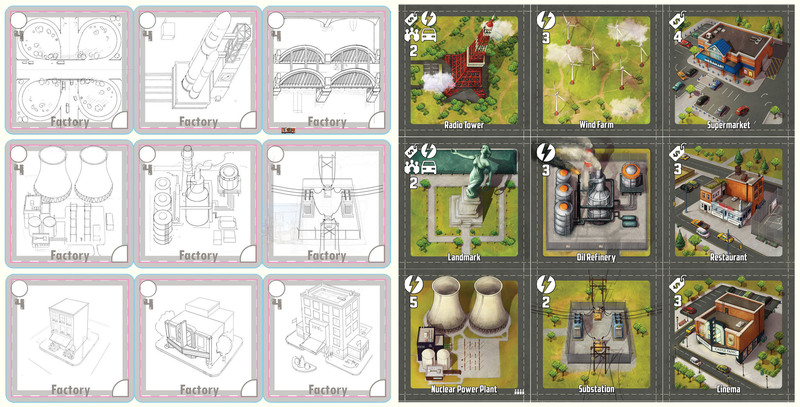 Aside for time… The board for Stop Thief! needed to show really a lot of gameplay information. Making rich and interesting locations that were believable, worked in harmony with the gameplay markings and did not fight for attention was tricky. Plus the scale and perspective is quite odd too. The production team for that game was great though and what we worked out together – came out well. I wish I’d had more time to add extra details and easter eggs. There are quite a few nice details hidden in there though. I’m impressed by you isometric skills! Is there any pitfalls game artisans should try to avoid ? Don’t be precious. I learned that back at Creative Assembly. Remember the games needs comes first. The art works in service of the game. Hopefully to improve the experience. It is not a showcase for your pictures. Together good art and a good game design can make something great. I have a 30” monitor with great colour and a large Wacom tablet run off of a Macbook. As I said before I rarely work on paper. The draws of my desk are full of prototyping resources for my own games though. 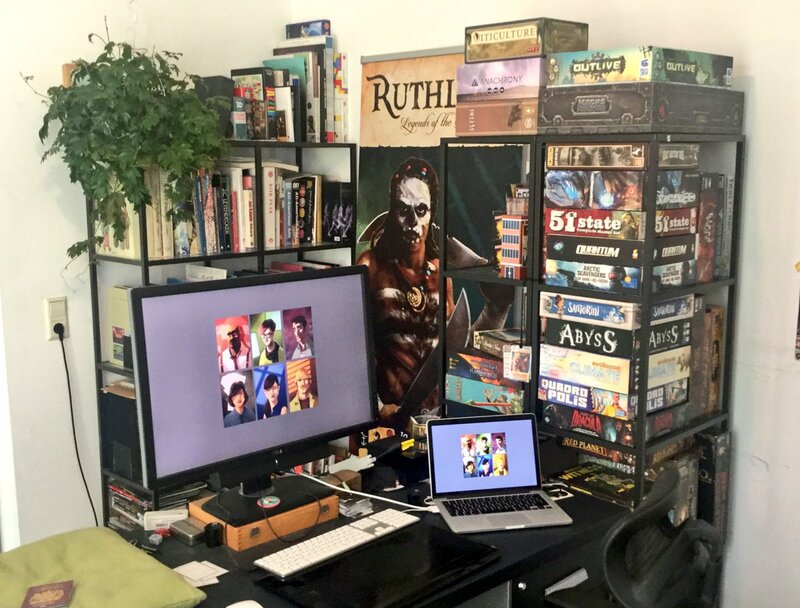 My Studio is also full of art books, comics and board games for inspiration. Can you name 1 to 3 artists/designers you admire? Beyond games J.C.Leyendecker, Yoshida Hiroshi and Mike Mignola all constantly impress me. Is there one game you think is particularly beautiful? I think Lewis & Clark Discoveries is spectacular. Art and graphic design are so well conceived. I own that just to look at. I have my own publication of Battle Line with a medieval theme currently being printed. I am finishing up the art for Ruthless to get that published for Essen and I have a job with a french publisher at the moment that I am just getting my teeth into. I want to start a new project of my own once these project are finished. I will have a booth at Essen this year with those projects and exhibiting my art for games. Booth 6-C103. There isn’t any in particular. The internet is awash with so many great resources for artists to self educate these days. I think most aspiring artists these days are better of learning online if they have the self motivation. I personally look for animation artists classes and tutorials as I think they are some of the most skilled artists and visual storytellers out there. Thank you Roland for giving us a glimpse of your creative process and journey. I look forward to see more from you in the future.